Get any-to-any connectivity with the Model 3086 ipRocketLink, and offer 2-wire standards-based transmission with TDM, WAN, and Ethernet/IP for fast, dedicated, always-on access. 10/100Base-T port for routed or bridged IP data, and choice of one V.35, X.21, or T1/E1 port for TDM data. Interoperable with Third-Party DSLAMs--Take advantage of Patton reliability whether you connect back-to-back or to a third-party DSLAM. WWW/SNMP Manageable--Built-in VT-100 console port makes setup a snap, and you can use the embedded HTTP/SNMP agent to manage the Model 3086 from anywhere in the world. The Patton Model 3086 ipRocketLink IAD redefines access and sets the new standard for customer premise equipment. Based on European Telecommunications Standardization Institute (ETSI) and International Telecommunications Union (ITU) G.SHDSL G.991.2 standard, the Patton 3086 ipRocketLink enables 2.3/4.6 Mbps speeds at nx64 (n=1..36/72) over a single pair of wires while combining standards-based transmission with TDM(V.35, X.21, or T1/E1), Ethernet, and high speed IP routing…all in one compact package. With Patton’s FlexIP™ architecture, the Model 3086 offers a V.35,X.21, or T1/E1 interface and 10/100 Ethernet ports. The Ethernet port enables access to any IP network via ATM, PPP, or Frame Relay while the TDM port transparently carries traffic to a data or voice network. Both interfaces can be simultaneously selected with user-defined bandwidth for each port. 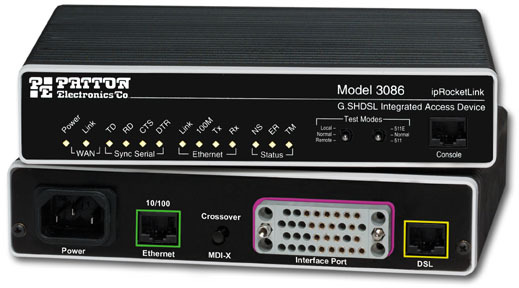 The 3086 boasts easy installation with DIP switch, Telnet, and WWW/SNMP management. It provides bridging and routing functionality, along with advanced IP features like NAT and Firewall, and optional IPSec-based VPN. As part of Patton’s family of ipDSL products, the Model 3086 offers a complete, managed, end-to-end system when used with Patton’s central site access concentrators. While Frame Relay remains the most economical service to connect multiple corporate locations over PVCs (Private Virtual Connections ) at burst and fixed data rates, high-speed DSL is becoming the technology of choice for last mile access to FR networks. Patton’s Model 3086 is the flexible and economical customer premise solution to provide direct FR and IP connectivity for small and medium size branch offices. DSL: G.991.2 ITU G.SHDSL Annex A and Annex B, G.994.1 G.hs. nx64 data rates over 2-wire full-duplex to 2.3 Mbps, symmetrical, TC-PAM encoding. Distance of 32,000 ft (9.8 km) at 192 kbps to 18,000 ft (5.6 km) at 2.312 Mbps. Management: EIA-561 RJ-45 RS-232, VT-100 CLI, TELNET, Embedded WEB/HTTP, SNMP, Logging or SMTP on events: POST, POST errors, line/DSL, PPP/DHCP, IP MPOA AAL5 and Bridged encapsulation RFC 2684 and RFC 1577 IPoATM. LLC/VC Mux support. ATM Support: UNI 3.0, 3.1, and 4.0 ATM QoS with UBR/CBR/nrt-VBR/rt-VBR and per-VC queuing and shaping. I.610 OAM network management including AIS/RDI, loop-back and performance monitoring. Protocol: Enhanced ILMI 4.0 for auto-configuration of ATM PVCs, IP (RFC 741), TCP (RFC 793), UDP (RFC 768), ICMP (RFC 950), ARP (RFC 826). IP Router with RIP (RFC 1058), RIPv2 (RFC 2453), OSPF (RFC 2328) Integrated DHCP Server (RFC 2131). Selectable IP leases and MAC/IP pairings. DHCP relay agent (RFC 2132/RFC 1542) with 8 address pools. DNS Relay. IGMP v1 and v2. IP-in-IP (RFC-2003) encapsulation, Ethernet Bridging. NAT/NAPT with integrated application support, MultiNat with 1:1 mapping, Many:1, Many:Many mapping, NAT Port/IP redirection and mapping. Indicators: LEDs: DSL Link; Sync Serial: TD, RD, CTS, DTR; T1/E1: Link, LOS, TD, RD; LAN: TX, RX, 100M Link; Status: NS, ER, TM. Power Supply: Internal universal 90 - 260 VAC input or 48 VDC input. Optional external power availale.